For collectors looking to break new Upper Deck products, it’s important you make your purchases from a Certified Diamond Dealer like Pastime Sports & Games. We think it is important to profile shops that are doing the right things and are very pro-collector. Such is the case with Pastime Sports & Games. I met their owner, Ken Richardson, at the Las Vegas Industry Summit and I was immediately impressed by his passion for the industry. Get to know Ken and his shop as he shares how he got into the business and why you need to visit Pastime Sports & Games! Hours: Mon-Tue – 10:00 a.m. – 6:00 p.m., Wed-Thu – 10:00 a.m. – 10:00 p.m., Fri – 10:00 a.m. – 12:00 a.m., Sat – 10:00 a.m. – 11:00 p.m., Sun – 11:00 a.m. – 9:00 p.m.
“I got my first job in a card store back in 1986 when I was 11. With the big card boom of late 1980’s, I was all of a sudden self-employed traveling around to different card shows at the ripe old age of 13. Not being old enough to drive, I actually had to pay people to take me around, but it was worth it because I was doing what I loved. I opened my first store in 1990. In 1993, I had the opportunity to open a store in Langley, British Columbia which was the same location where I got that first job. I was only eighteen and had to decide between school and the retail business. With a lot of ambition and not so much money, I choose the retail business and I am sure glad I did! “Pastime opened selling only sports cards and comics books. How times have changed. We first added role playing games and collectible card games to mix of items we offered. By diversifying our product, we noticed we were getting new people in the store all the time. Becoming successful by offering a wide range of products has made the shop a fun place to visit for all types of collectors. In addition to a wide range of trading cards, you can now find a vast selection of hats, t-shirts, jerseys, pictures, vintage memorabilia, autographed items, team logo licensed items, board games, trading card games, role playing games and miniature war games. “Running events where our fans can get involved has become the backbone of Pastime Sports & Games. 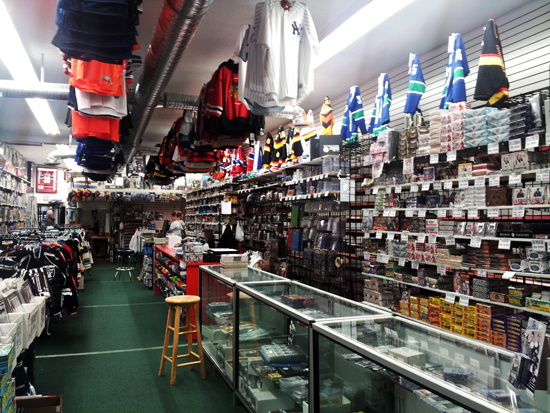 Whether it’s a current Canuck or Hockey Hall-of-Fame member, you can meet your sports heroes at Pastime Sports & Games. In the last year our guests include: Guy Lafleur, Johnny Bower, Ryan Kesler, Alex Burrows, Cory Schneider, Geroy Simon, Travis Lulay, Phil Esposito and Darryl Sittler. 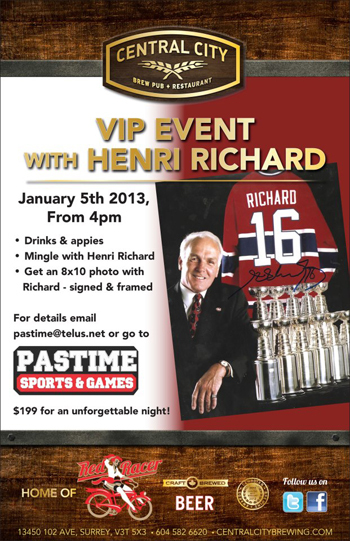 We will be hosting a special evening in January with Henri Richard that hockey fans will not want to miss! 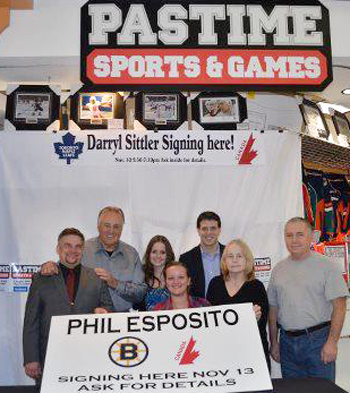 “Check out some of the excitement from our Phil Esposito autograph signing event at the shop! “TCG fans can also find weekly gaming tournaments for games such as Magic:TG, Yu-Gi-Oh!, Pokeman and Cardfight Vanguard. We really try to offer something for everyone! Stop in and visit the good people at Pastime Sports & Games today!